If you have a Nissan, then you already know that you have a reliable vehicle that won’t let you down. However, as reputable as this brand is, the fact is that all cars will break down over time, which means that you need to stay on top of their maintenance and upkeep. One of the best ways to do that is with an OBD2 scanner. These handy devices enable you to check on your Nissan’s internal systems whenever there’s a problem so that you can fix it faster and more efficiently. Today, we’re going to look at the top models for Nissan vehicles. Let’s see what they have to offer. When picking out OBD2 scanners, it’s usually a good idea to pick units that are specific to your car’s brand. Although generic versions can work well, they can be a bit of a hassle because you have to sift through everything else to find your codes. Thus, this model from iCarsoft is ideal for Nissan owners because it’s only rated for Nissan and Acura vehicles. Therefore, you can be sure that you have the right software to diagnose and manage all of your car’s internal systems. When OBD2 scanners first came out, they were only designed to help you diagnose your check engine light. Thus, you had to wait for something to go wrong before you could even use it. Fortunately, modern versions like the i903 from iCarsoft enable you to monitor your Nissan’s performance in real-time. Now, instead of waiting for a problem, you can be more proactive and check out what’s happening under the hood whenever you want. Scans Engine, ABS, Airbag, etc. Another benefit of modern OBD2 scanners is that they can do so much more than check your engine. With the i903, you can also monitor other systems like airbags, brakes, and tire pressure. Overall, you can manage everything happening inside your Nissan, making this a comprehensive diagnostic and automotive tool. We appreciate the fact that this scanner is specific to Nissan models, which helps ensure that you won’t have any trouble finding the right codes. Also, the live streaming of performance data and the rugged design are benefits that users will like. Although this scanner works for most Nissans, you may have to download additional software, depending on your specific model. Also, compared to other units, this one has a much smaller screen. Usually, OBD2 scanners are designed to help you figure out what’s wrong with your vehicle. However, if you’re much more of a car enthusiast, you want to be able to do more than diagnose a dashboard light. TOAD stands for Total Onboard Auto Diagnostics, and it’s one of the best software systems out there. Let’s see how it can help you and your Nissan. Unlike other OBD2 scanners, this program comes with everything you need to keep your vehicle running smoothly. Not only can you look up error obd2 codes, but it has extensive repair manuals and forums so that you can find out what to do next. Modern cars have onboard computers that manage and control everything under the hood. What if you could tweak the computer to improve your vehicle’s performance? With TOAD, now you can. Overall, this is probably the most comprehensive scanning software you can find. Whether you’re a car enthusiast or a professional mechanic, you will love what’s possible with TOAD. As we mentioned, many modern OBD2 scanners can check a multitude of internal systems. Unfortunately, TOAD cannot. It strictly monitors and manages your engine, so other elements like tires, brakes, and oil are not part of the package. If you want an OBD2 scanner that is simple to use and comes with powerful diagnostic tools, you will appreciate this model from Autel. The DS808 is one of the better scanners out there, thanks to its comprehensive onboard software. One thing that sets this tool apart from the rest is that it’s much easier to use, as well as read the error codes and repair manuals. Rather than squinting at a tiny screen, now you can use a large, 7.5-inch tablet instead. Not only is the tablet much more user-friendly, but it’s designed for mechanic workshops, so it’s built to handle rough environments. You can be sure that it will last for years to come. We cannot overstate how helpful it is to track your Nissan’s performance in real-time. This capability can really help you get the most out of your vehicle since now you can spot potential problems before they arise. With the DS808, you can not only scan live data, but you can save it and monitor it over time so that you can see how your Nissan performs and make adjustments as necessary. We appreciate the simplicity and ease of use of this tablet system. We also like that you can use the scanner for a variety of diagnostic and repair functions. It’s like having a mechanic in your hands. The operating system for the tablet is not state-of-the-art, so it can run into problems and glitches from time to time. Also, it can be slow at times, so you have to be patient with it. While having software on your computer or a tablet is handy, it may not be the most convenient. For car enthusiasts who don’t need a full suite of repair and diagnostic services, having a handheld scanner like this one from Innova may be just the right tool for the job. Although this is one of the more straightforward scanners on the market, that doesn’t mean you can’t do a lot with it. Rather than being limited to check engine lights, you can monitor all of your Nissan’s internal systems, such as airbags, tire pressure, and oil. This scanner provides a lot of diagnostic power in the palm of your hand. Since you can check on all of your Nissan’s systems, it helps that you can also see everything in real-time. This capability ensures that you don’t have to take your car to the mechanic until something is really wrong, thanks to the fact that preventative maintenance is much easier overall. 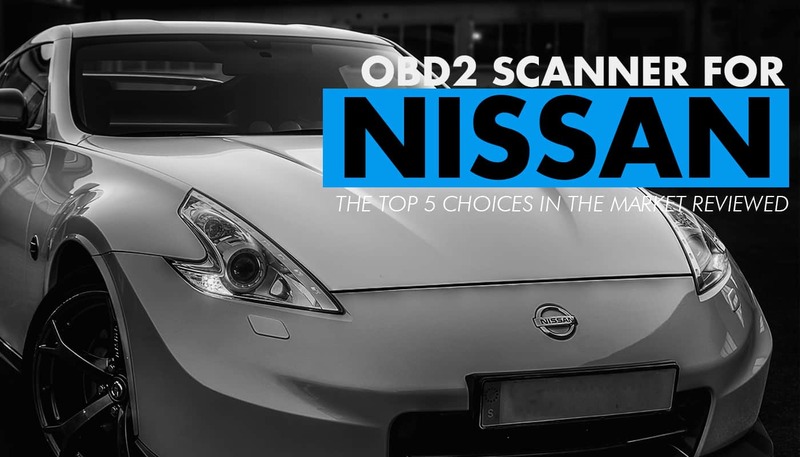 The size and capabilities of this scanner make it a worthwhile choice for most Nissan enthusiasts. While it’s not as powerful as some other programs we’ve seen, it’s perfect for standard diagnostics. The software on this scanner isn’t as reliable as others that we’ve seen, so you may have trouble connecting it to your computer. Also, you may not be able to check all systems in your Nissan, depending on the year and model. Our final OBD2 scanner is another “standard” model that will work well for Nissan enthusiasts of all skill levels. If you’re trying to be an at-home mechanic, this tool will help, but it doesn’t offer as many bells and whistles as brands like TOAD or iCarsoft. Nonetheless, this device has a lot to offer. Let’s see why. Keeping your Nissan in working order is a breeze when you’re able to see what’s happening under the hood in real-time. This scanner allows you to look at the data and save it for later so that you can compare your vehicle’s performance over time. As with other modern OBD2 scanners, you can check on a variety of internal systems - not just the check engine light. Monitoring your battery, brakes, and tire pressure is a breeze, thanks to the comprehensive diagnostic checks offered. Overall, this is a decent scanner with a lot of functionality. It’s compact, easy to use, and will provide you with a bunch of useful information about your Nissan. Because this scanner isn’t specific to Nissan vehicles, some functions may be limited or unavailable, so keep that in mind. Also, the software for the scanner isn’t as high-quality as others on this list. When trying to find the best OBD2 scanner for Nissan, we have to say that the iCarsoft i903 is the best handheld device out there. We like that it’s specific to this brand and that it offers comprehensive scanning and diagnostic tools. If, however, you prefer software-based scanners, then TOAD will be your best option. Although it doesn’t check other internal systems, it offers the most bang for your buck. Also, with the ability to fine-tune your Nissan’s onboard computer, you can be sure that your car is always in prime condition.